Very charming 1 bedroom apartment of 52 m² located on the ground floor of a XVII building at 50 meters of the Palace of the Popes. Renovated in 2017. The bedroom with its new bedding and quality (160cmx200cm) which can be divided in 2 single beds (80cm) overlooks a charming old courtyard. An underground and toll park space is at 30 meters. ( 19 Euros per 24H or 40 Euros for one week. If you stay more than 2 days, it is cheaper to take the week rate ticket ). Fond of history, architecture and art, I have been in Avignon since 2 years. I am using Home Away when travelling. Secure parking space ( 11 Euros/24 heures) at 20 meters : Parking du Palais. We had a lovely stay in this appartment , the location was pretty special. It is tastefully decorated in keeping with the area. Although we did not meet Alain, his housekeeper was very helpful with hints for restaurants and places to explore. It was perfect for 3 adults and I would highly recommend to others who are visiting Avignon. It is such a peaceful place to return to after busy sightseeing! We enjoyed our stay at this apartment. The layout was good for us, with the sofa bed for our adult daughter in the large living room. No complaints. Wonderful apartment, perfect location. Alain a most charming and helpful host. 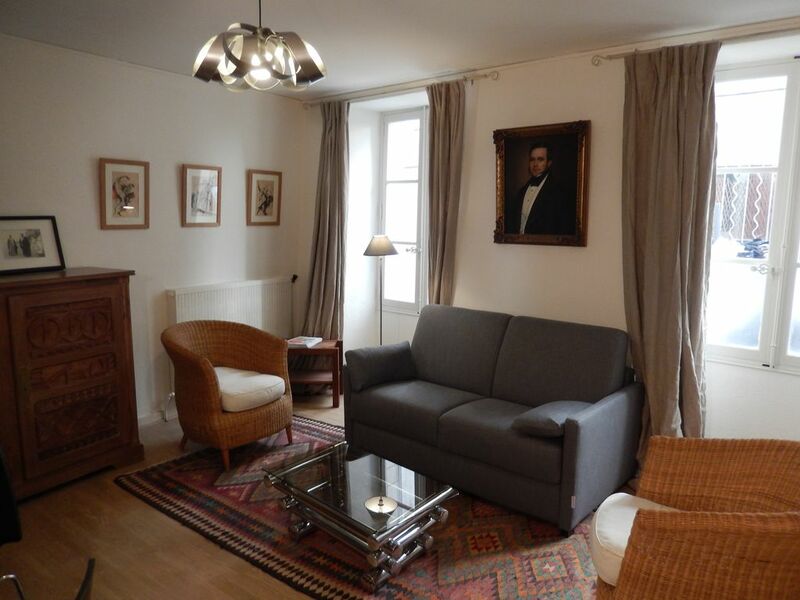 Clean, nicely appointed and well situated to all the important sites in Avignon. My wife and I were first-time visitors to Avignon. Alain and his housekeeper Chantal were very helpful with restaurant suggestions and navigating Avignon. The apartment is spacious and tastefully decorated. The windows open onto a lovely courtyard which lets in the cool night air. It is well situated, close to good restaurants and the major tourist attractions, yet it is quiet and calm when you open the windows. A perfect spot, we’ll be back again! The apartment was the perfect size for the two of us, with room to relax. The kitchen was well appointed, the location could not be more convenient. The only problem was that our schedule did not permit a longer stay. It was a delight. The apartment was well appointed, very clean and close to everything. We thoroughly enjoyed our time in the apartment which was clean and well appointed. It was great to be living in the heart of such an historic area. Alain was very helpful in giving us ideas as to the best places to visit. I would be very pleased in helping you in the right choice of good restaurants and nice places to discover in Avignon and its neighborhood.